This is the same as our popular OSE-1190 assembled cable, except the propeller shaft is shorter by .37" (9.4mm). Using this call will allow more strut adjustability when used with the shorter struts on the market. NOTE: Flex cable lengths are from tip of shaft to end of cable. Example, 18" cable is aprox 15" of cable and 2.75" of prop shaft. Lengths are approximate and can be plus or minus one half inch. These require the customer to cut these to their required length. 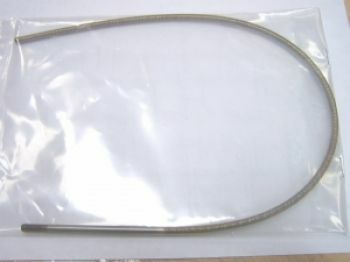 (1) .187" (4.74mm) diameter flex cable.